If there is a day of the week best-suited to relaxation, then Sundays are usually that day. It’s a day for sleeping in, for spending with friends, for enjoying a good cup of coffee, a delicious bite to eat, and a long walk in the fresh air. 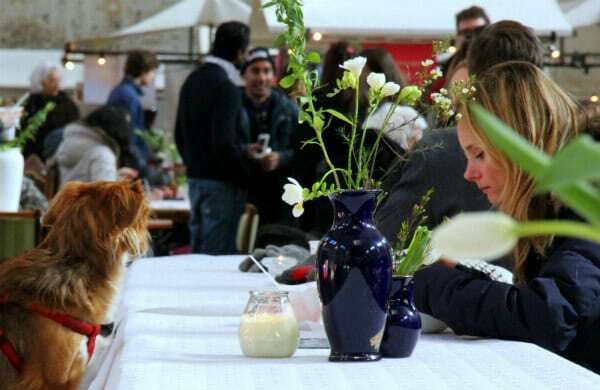 If you’re in Amsterdam on such a Sunday, and if it’s the third (or sometimes fourth) Sunday of the month, then make your way to the NeighbourFood Market at the Westergasfabriek and enjoy everything that Sundays are meant to be. Not only worth it for the food, the location is striking as well. Open from 11am to 5pm, the NeighbourFood Market caters to those ambitious enough to be out and about before noon, as well as those looking for a leisurely, late lunch. It’s a market which showcases organic farmers, local producers, bakers, butchers, baristas, and it’s a place for everyone who appreciates great food and drinks. The exact location can vary each month but it’s always held inside one of the massive halls of the Westergasfabriek, and spills outdoors onto the Westergasterrein. The best way to enjoy the market is with a group of friends; it is a place made for socialising. Whether it is inside on a thrift-store sofa on a gloomy day or outside on the grass soaking up the sun’s rays, the NeighbourFood Market brings people together. More people also allows you more opportunity to sample and share different dishes among yourselves. First make a round of the market to feast your eyes upon what’s on offer, as chances are it will all look great and you’ll want to try everything. Sharing with friends is a sure-fire way to make sure you can. While the NeighbourFood Market is a place to be inspired by food you may not normally eat, it’s now also a place for shopping. One end of the hall is turned into a flea market, with charming second-hand furniture, clothes, jewellery, and other funky finds. After you’ve tasted and shopped your way through the market and fortified yourself with a coffee from de Espressobus, stretch your legs outside and explore the rest of the Westergasfabriek cultural park, an urban oasis in the bustling city of Amsterdam. The Westergasfabriek was built in 1885 and functioned as a gasworks factory until 1967, supplying gas for public lighting in the city. The area was heavily polluted during this time but now after extensive redevelopment, functions as a creative and cultural destination in Amsterdam. Various festivals, exhibitions, and events take place there throughout the year, but the natural beauty of the surrounding Westerpark is on display every day. Reflections on the waterways of the Westerpark. If you need to walk off your overindulgence after the NeighbourFood Market, there are around 15 kilometres of cycling and walking paths traversing the park and it is part of the Brettenzone ecological area. Families with children will enjoy the petting zoo nearby, in addition to feeding the ducks floating down the many waterways of the Westerpark. As the seasons change so do the colours of the park, but due to the wide variety of plant and animal life, as well as the diverse cultural offerings, there will always be something to stimulate your senses. (Photo Credit: Tanya Braaksma)[\/caption]\r\n\r\nOpen from 11am to 5pm, the NeighbourFood Market caters to those ambitious enough to be out and about before noon, as well as those looking for a leisurely, late lunch. It\u2019s a market which showcases organic farmers, local producers, bakers, butchers, baristas, and it\u2019s a place for everyone who appreciates great food and drinks. 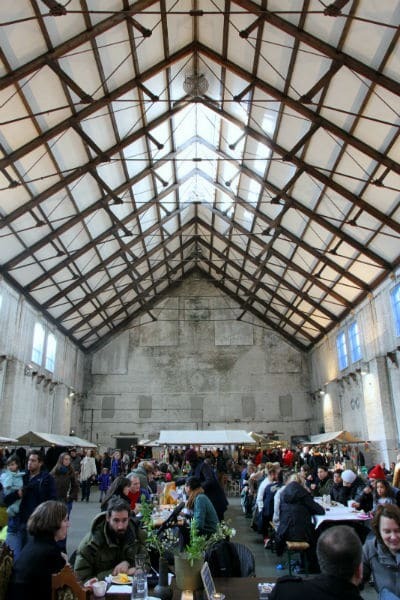 The exact location can vary each month but it\u2019s always held inside one of the massive halls of the Westergasfabriek, and spills outdoors onto the Westergasterrein.\r\n\r\nThe best way to enjoy the market is with a group of friends; it is a place made for socialising. Whether it is inside on a thrift-store sofa on a gloomy day or outside on the grass soaking up the sun\u2019s rays, the NeighbourFood Market brings people together. More people also allows you more opportunity to sample and share different dishes among yourselves. First make a round of the market to feast your eyes upon what\u2019s on offer, as chances are it will all look great and you\u2019ll want to try everything. Sharing with friends is a sure-fire way to make sure you can.\r\n\r\n <\/a> The NeighbourFood Market isn't just for humans. (Photo Credit: Tanya Braaksma)[\/caption]\r\n\r\nWhile the NeighbourFood Market is a place to be inspired by food you may not normally eat, it\u2019s now also a place for shopping. One end of the hall is turned into a flea market, with charming second-hand furniture, clothes, jewellery, and other funky finds.\r\n\r\nAfter you\u2019ve tasted and shopped your way through the market and fortified yourself with a coffee from de Espressobus<\/i>, stretch your legs outside and explore the rest of the Westergasfabriek cultural park, an urban oasis in the bustling city of Amsterdam.\r\n\r\nThe Westergasfabriek was built in 1885 and functioned as a gasworks factory until 1967, supplying gas for public lighting in the city. 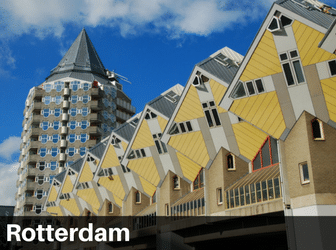 The area was heavily polluted during this time but now after extensive redevelopment, functions as a creative and cultural destination in Amsterdam. 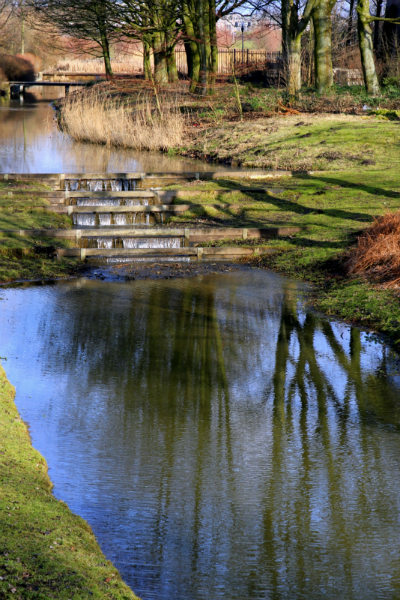 Various festivals, exhibitions, and events take place there throughout the year, but the natural beauty of the surrounding Westerpark is on display every day.\r\n\r\n <\/a> Reflections on the waterways of the Westerpark.